Light has long symbolized human inspiration, imagination, and fantasy. In modern days, it is a key driving force behind information technology and it is literally lighting the way to green energy revolution. The International Year of Light and Light-based Technologies (IYL 2015) presents a unique opportunity to inspire, educate, and connect on a global scale. The promotion of key ideas and the corresponding outreach activities for IYL 2015 was well received by the many organizations and institutes in Taiwan, which include (but not limited to) the Physical Society (PSROC), the Center of Advancement for Science Education (CASE) of National Taiwan University, the Interdisciplinary Science Education Center of National Tsing-Hwa University, the Taiwan Photonics Society, National Synchrotron Radiation Research Center (NSRRC), Photonics Industry and Technology Development Association (PIDA), Taipei Astronomical Museum, etc. Riding on the wave of IYL 2015, many activities and events are planned in a laissez-faire style with some popular themes commonly found in Taiwan’s night market. The cover page of PSROC’s Physics BiMonthly special issue on IYL, published in April 2015 . Credit: PSROC. In Asia, an innovative ancient Chinese philosopher, Mozi (470 BC – 391 BC)  provided the first documentation on the working principles of light. In his work (which was also named “Mozi”, after himself), he gave a detailed description on geometrical optics. Celebration of light through the Lantern Festival  in Chinese Society dated back to 200 BC. The festival is held on the 15th day of the first month in the lunisolar year of the Chinese lunar calendar, and it marks the last day of the Lunar New Year celebration. The latter celebration is usually held in February or March in the Gregorian calendar. The Lantern Festival has been a festival of great significance as early as the Western Han Dynasty (206 BC-AD 25). The festival is symbolized with imaginative colorful lanterns embossed with intriguing lantern puzzles and riddles. Delicious glutinous rice balls named after the festival yuanxiao itself (and also known as tangyuan (湯圓)) are well received by both adults and children. This unique combination of activities in the traditional Lantern Festival provides a very creative, intellectual, and enjoyable atmosphere. In Taiwan, the festival has attracted more than 8 million visitors annually in the last few years. The pop-science booths for the promotion of IYL 2015 with the DIY kits. Credit: PSROC. 2 – Mozi (470 BC – 391 BC), https://en.wikipedia.org/wiki/Mozi & http://www.iep.utm.edu/mozi/#H3. 3 – The Taiwan Lantern Festival. 4 – The teams also include Profs. Tsu-Yi Fu & Kwok-Tung Lu of National Taiwan Normal University, Prof. Tzu-Fen Lin of National Taitung University, Prof. Hsiang-Shun Chou of National Ocean University, and Prof. Wei-Chin Hung of ROC Military Academy. 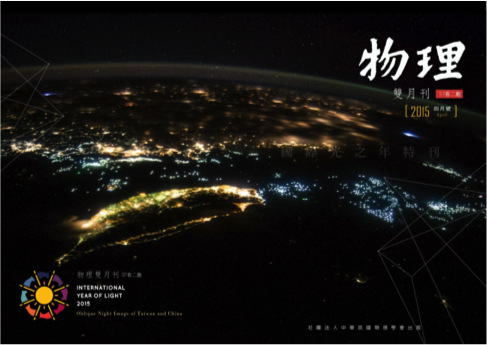 11 – Taipei Astronomical Museum; the IYL2015 special exhibition. Fu-Jen Kao is a Professor of Biophotonics at the National Yang-Ming University, Taiwan. He is currently the President of the Physical Society in Taiwan (PSROC).He received the B.S. degree from the Department of Physics, National Taiwan University in 1983, and the M. S. and Ph. D. degrees from the Department of Physics, Cornell University, in 1988 and 1993, respectively. His research interests are applications and developments of laser scanning microscopy and endoscopy. Dr. Kao is also a fellow of the SPIE, a senior member the Optical Society of America, and a member of the American Physics Society. He is currently an organizing member of the Focus on Microscopy committee. Thank you for the in-depth account on Taiwan’s photonics industries, which often (and may prefer to) assume the role of elves for the world’s photonics demands, being low-key and efficient.